Have quilted a couple of small quilts only, and forgot to take some photos, so posting a couple of oldies for you to look at. 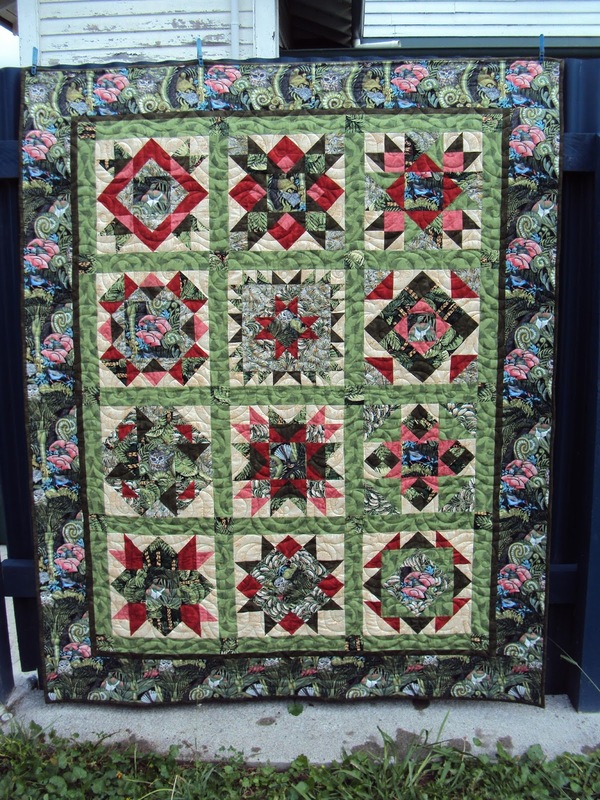 I have loaded a gorgeous medallion quilt today but didn't get started as my brain did not want to co-operate at all, so felt I should not even try to quilt. Tomorrow I will be into it. Hope you are all very well and avoiding all those horrible winter ailments. If you are in summer, don't forget the sunscreen!! It is so exciting watching the trees starting to bud up and the bulbs pushing their way through the cold ground. Spring is getting ready to burst through!! This was the Shop Hop quilt I designed in our last year of trading as a patchwork shop.This photo is unquilted...forgot to take one of the whole thing quilted. I quilted this one on my Janome Horizon 7700 just to prove you can do a large quilt on it. Didn't like all the handling of the quilt of course as I am spoilt by my longarm. This quilt now adorns the bed in our guest room. I never did like the quilting in the vase...it's too crooked, but as always I was under pressure to get it finished in time and it has stayed crooked!! This was one of my all time favourite Shop Hop quilts as it uses Kaffe Fassett fabric. It was very bright and colourful and I gave it to my close friend who just adored it. Definitely delicious, dont you agree. And last but not least, this was our Block of the Month featuring New Zealand fabrics. My friend Maria Travers from Masterton designed it exclusively for us and it was most successful. It is a favourite quilt of mine. So there you go my friends, a bit of a walk down memory lane for me, and a heads up to you all that I am still in the land of the living. We are now anxiously awaiting the arrival of our 16th grandchild as Mum has gone into early stages of labour today. We are so looking forward to the joy of a new child to join our family, and Mum is deciding on what colours she would like for this one's quilt. It will help to soothe the pain of our loss of one of our wee twins...went to sleep and woke up in heaven. Your prayers for the Mum would be lovely. May you have an awesome weekend. Don't forget to make time for those you love while you have time to love them.